IN 1984 US PRESIDENT Ronald Reagan and his wife Nancy made a visit to Ireland that was both highly anticipated and hotly debated. Among those anticipating the First Couple’s stay here were numerous singers, musicians and entertainers, who saw their chance to gain an audience with the most powerful man in the world. Brendan Grace and the lost ballad of Ronald Reagan. What better way to welcome President and First Lady Reagan to Ireland than with a specially written Brendan Grace ballad? That was certainly what Mr Grace thought, as he petitioned not only to release a song entitled Back to the Homeland in honour of the visit and perform the song for the president, but also to donate all of the royalties to cause close to Grace’s heart, the Central Remedial Clinic. 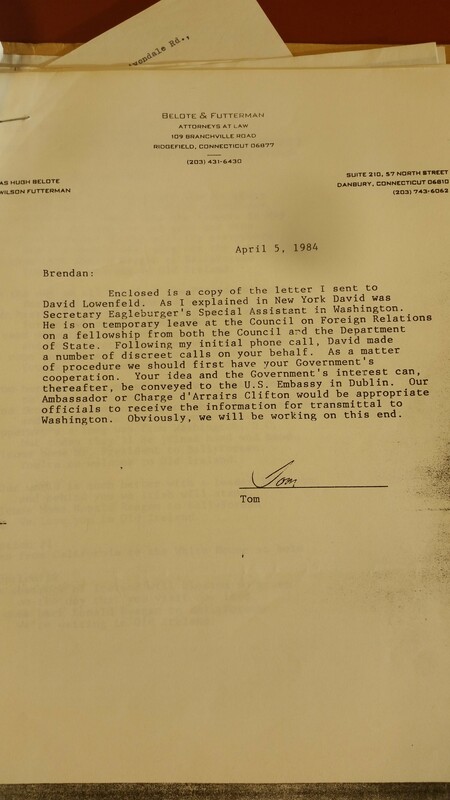 Various correspondences ensued, including one from to Grace from his legal representation in New York, who suggested that it might be worthwhile to get the Irish government and then the US embassy on side if the idea was going to fly. 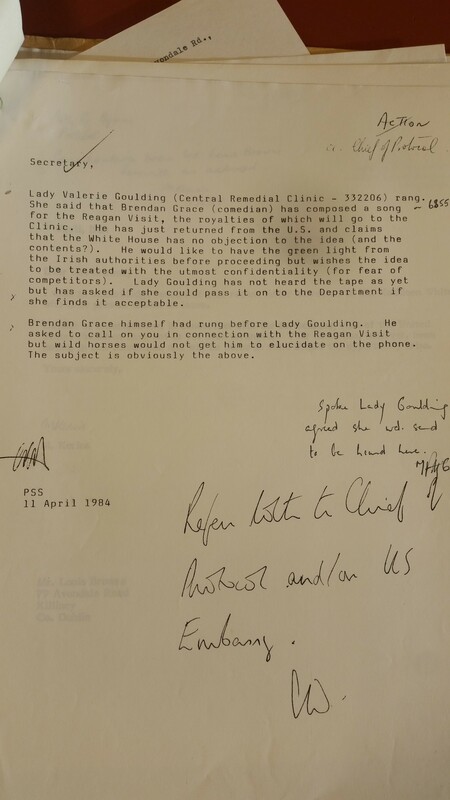 So, in April 1984 Brendan Grace placed a mysterious call to the Department of Foreign Affairs, looking to speak to someone in authority “in connection with the Reagan visit”. A wry note made after the call indicates that he could not be persuaded to reveal any more details. Wild horses could not get him to elucidate on the phone. 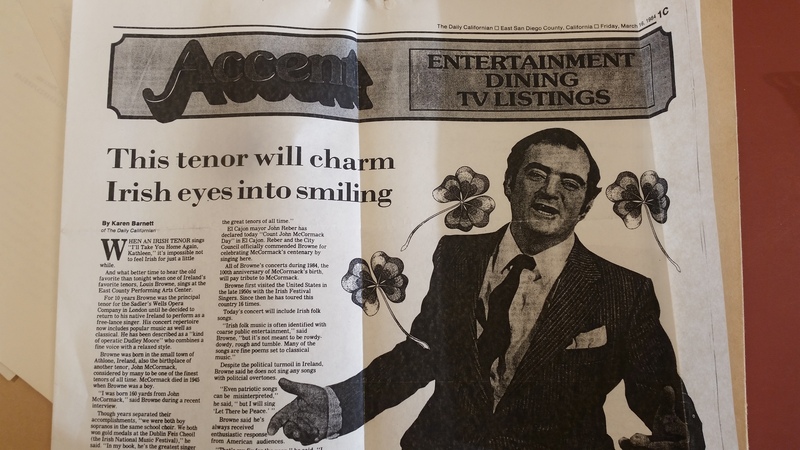 However, the note also reveals that chairperson and managing director of the CRC Lady Valerie Goulding rang the DFA too, spilling the beans about the song and telling them the green light from the authorities would surely help set the wheels in motion. 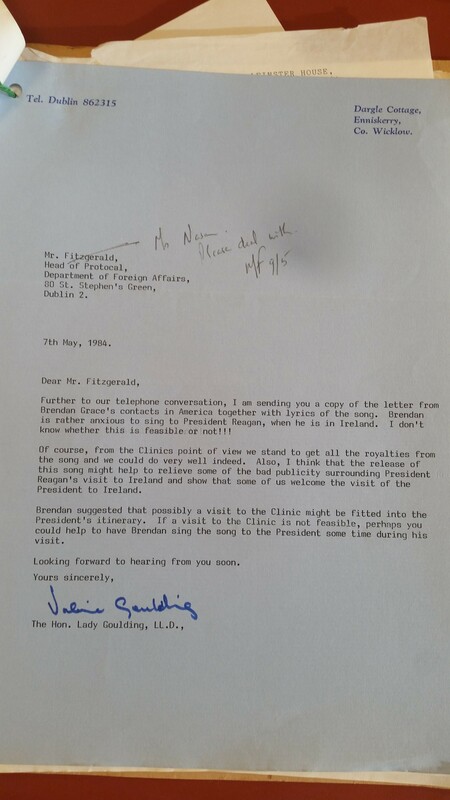 Lady Goulding also wrote to the DFA, intimating that such a performance would not only yield revenue in the form of royalties for the Clinic, but could “help to relieve some of the bad publicity surrounding President Reagan’s visit to Ireland and show that some of us welcome the visit of the President to Ireland”. 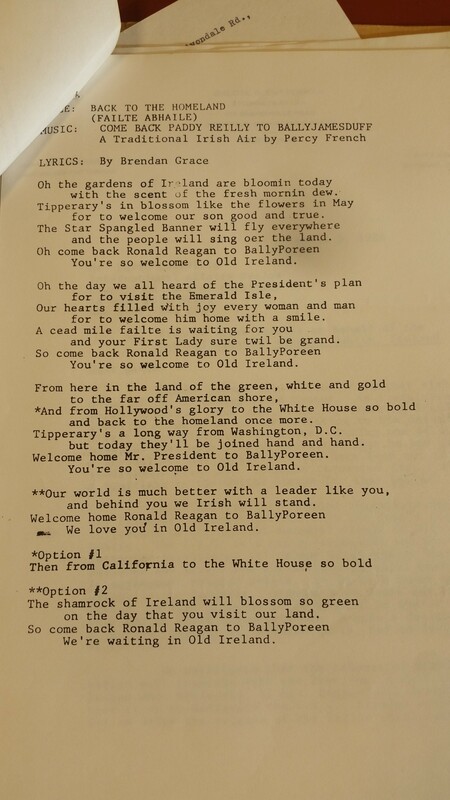 She also included a copy of the lyrics of Back to the Homeland, with its references to the ‘Star Spangled Banner’, Reagan’s ancestral home of Ballyporeen and the “White House so bold”. There, however, our paper trail ends. It seems that the performance never happened, the song was never released, and the world never got to hear “Tipperary’s a long way from Washington DC, but today they’ll be joined hand in hand, welcome home Mr President to Ballyporeen, you’re so welcome to Old Ireland”. Renowned Irish musician Phil Coulter was very eager to perform for the President and the First lady. 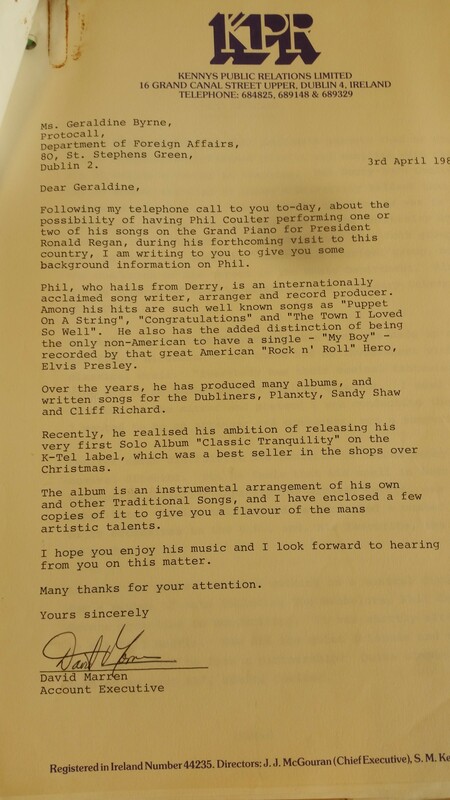 Several items of correspondence sold Coulter as the ideal candidate to entertain the visitors, describing him as an “internationally acclaimed song writer, arranger and record producer”. And it seemed to have worked, for a while at least. Coulter was due to perform for the Reagans at Ashford Castle, where they were staying as guests of then-owner John Mulcahy. However, for reasons not disclosed, the performance was cancelled. 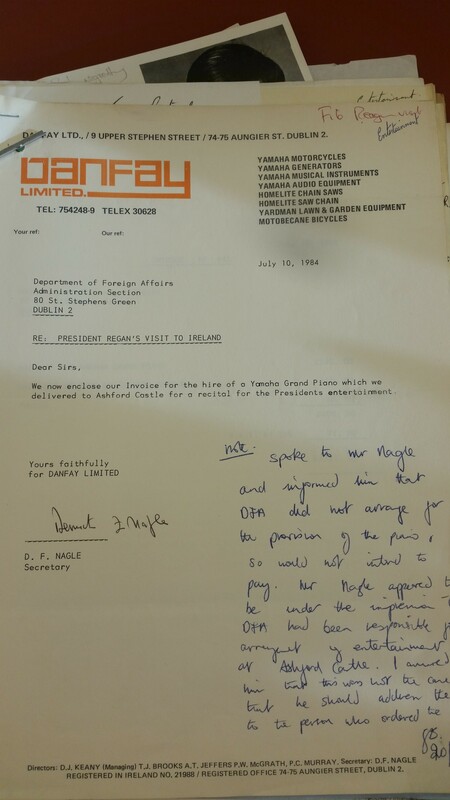 K-Tel and Phil Coulter were not happy, and wrote to the Taoiseach to tell him. Naturally, this was not only most disappointing but in view of the considerable expense, planning and organisation already expended, most embarrassing. To endeavor to set these arrangements in reverse will now cause us further expense. 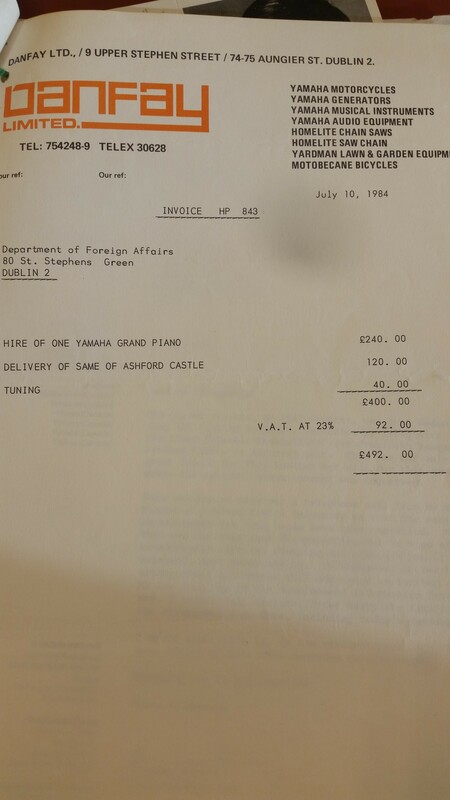 … and informed him that DFA did not arrange for the provision of the piano, so would not intend to pay. 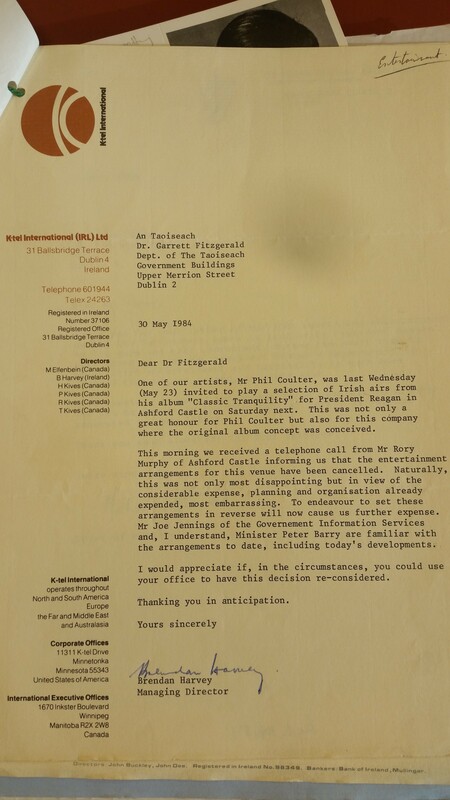 Mr Nagle appeared to be under the impression that the DFA had been responsible for the arrangement of entertainment at Ashford Castle. I assured him that this was not the case and that he should address the invoice to the person who ordered the piano. So, who do you think ordered the piano? 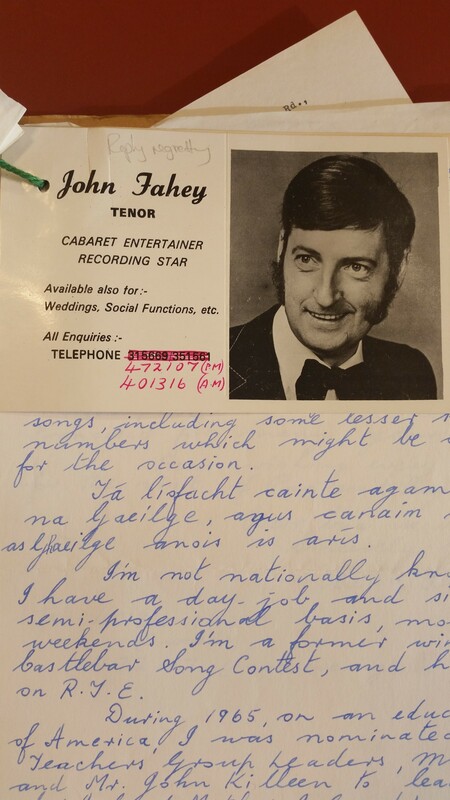 Among the other budding performers eager to entertain the visitors were the “newly formed Oireachtas Choir” which had “quite a lot of TDs and Senators attached”. While tenor Louis Browne detailed how he had just returned from a “short concert tour of the USA”, and sent along a clipping. Read: What did Ronald Reagan eat on his visit to Ireland? 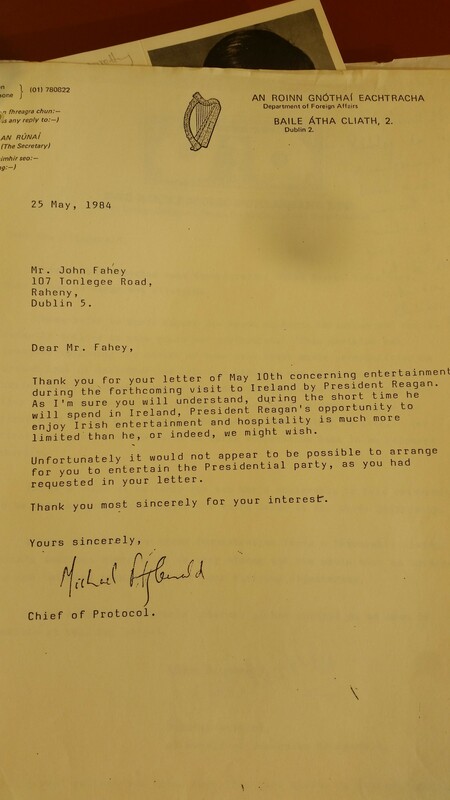 Email “The secret songs, pleading letters, and big name snubs of Ireland's plans to entertain Ronald Reagan”. 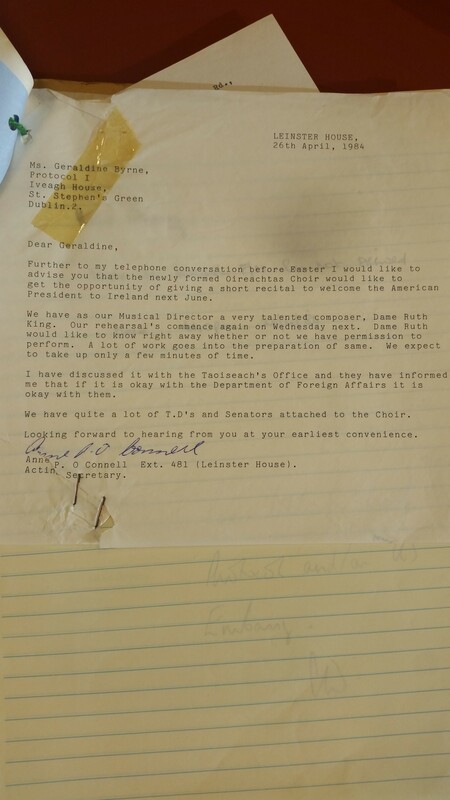 Feedback on “The secret songs, pleading letters, and big name snubs of Ireland's plans to entertain Ronald Reagan”.